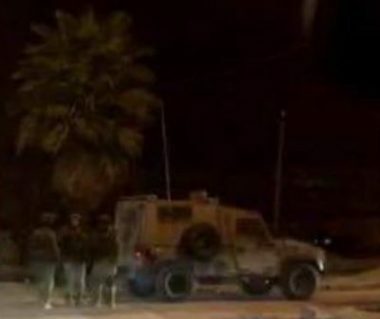 Dozens of Israeli soldiers invaded, on Tuesday at dawn, the al-Fawwar refugee camp, south of the southern West Bank city of Hebron, and Beit Ummar town, north of the city, before abducting a young man, and summoned another Palestinian for interrogation. Media sources in Hebron said the soldiers invaded and searched several homes in the al-Fawwar refugee camp, and interrogated many Palestinians before abducting a young man. They stated that the soldiers abducted Mohammad Abdul-Mo’ti Ghatasha, 26, and took him to an unknown destination. Furthermore, the soldiers invaded homes in Beit Ummar town, north of Hebron, and summoned Ibrahim Abu Mariya, 57, for interrogation in near Etzion military base and security center.